Who ever said affordable engagement rings can’t be excellent quality and jaw-droppingly gorgeous? These rings prove otherwise. Sorry not sorry. 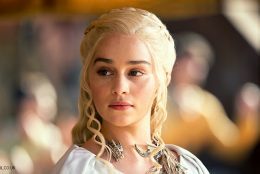 That “Three Months’ Salary” myth about how much you need to spend on the ring? We’re here to say once and for all: set your budget within your comfort zone! 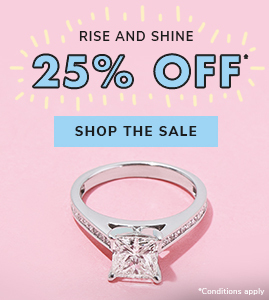 You can get the most bang for your buck by buying your engagement ring online. JamesAllen.com presents quality craft, 360° tech to examine and understand your own diamond (all conflict-free! ), rockstar Customer Service, and over 500 ring styles to find your dream affordable engagement ring. All rings are design-your-own, which means that you can choose a ring setting, metal, and diamond combo that is kind to your wallet. No matter what your style or budget, we’ve got you covered! The pavé band on this ring makes it look like the band itself is made of diamond and boosts your main-event center stone. 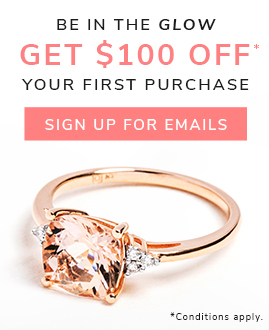 Low-key: this ring features a nearly-identical setting style to that of country darling Carrie Underwood! Super-modern clean lines frame a sparkling halo. This ring’s center diamond is wrapped with nature-inspired, vintage art. An elegant and unique engagement ring choice. Back to the brilliant basics! This shining solitaire setting pulls all eyes to its center stone, be it a diamond or a gemstone. This six-prong stunner is a fan favorite. Three side stones on either side of the center stone add a delicate touch of sparkle. 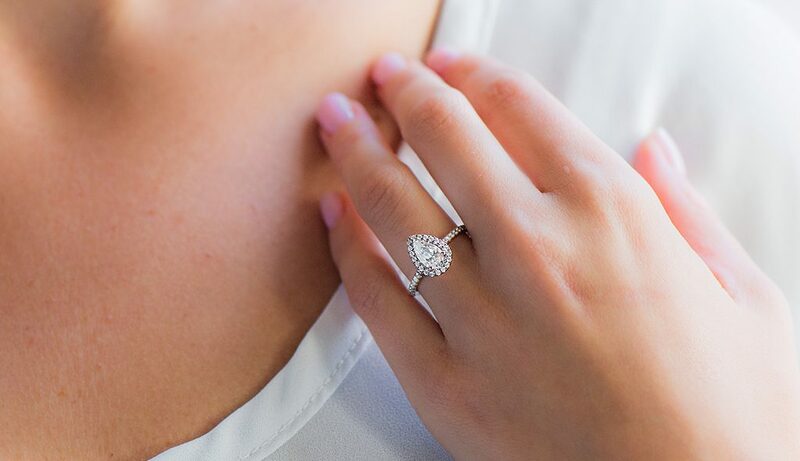 Light dazzles off the diamonds in the center, the halo, and the pavé band. We love this setting with a brilliant and trendy pear shaped diamond (and so do Ariana Grande and Cardi B!). A graceful band design with shine that seems to go on forever. The craftwork of this ring is clear in the metal’s elegant curves. 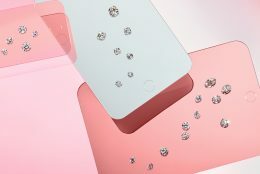 Gemstones or diamonds? Choose a ring with the best of both. This vintage design looks even more timeless with a cushion cut diamond. Gold is the new black tie! Tapered channel-set diamonds draw the eye to the center stone, while echos of a bow tie make this ring an instant classic. Intentional and intricate metalwork sets this beautiful ring apart. A twist (all pun intended) on the traditional solitaire. The sides of this center stone are surrounded by a subtle surprise: a strip of glittering pavé diamonds. All the shine of a solitaire with a shimmering bonus. 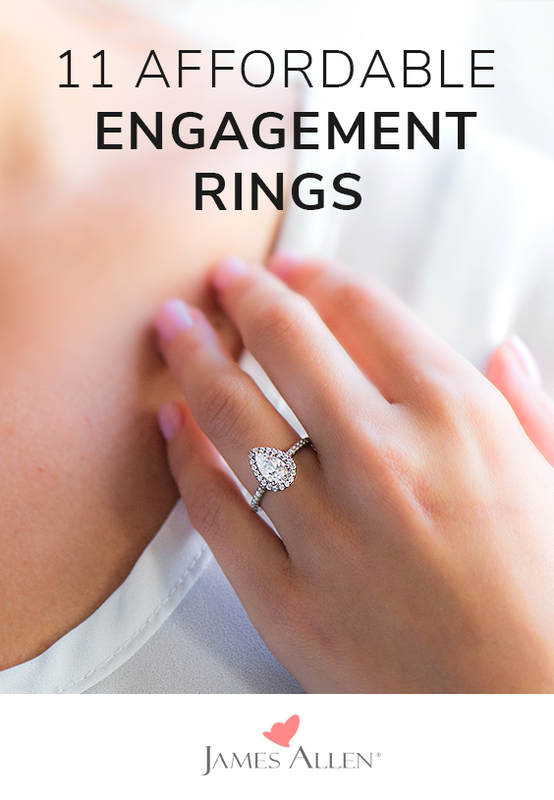 In love with one of these affordable engagement rings? Let us know in the comments below, or on our social channels: Instagram, Facebook, Snapchat, or Twitter.